Forums » General Forum » General Discussion & Questions » BeoLab 6000 and Yamaha WXC-50 - any advice or alternatives? 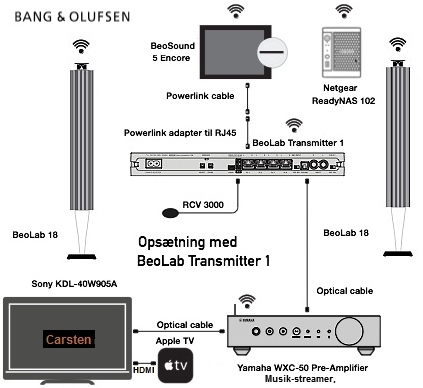 BeoLab 6000 and Yamaha WXC-50 - any advice or alternatives? I have recently bought some lovely beolab 6000 speakers, and a fantastic beogram 5500 after moving into a new house. I soon found out that active speakers and the sonos amp were not good bed fellows. Originally, the sales assistant in richer sounds recommended the Yamaha WXA-50 - as it had an aux out (RCA) - however, when I connected this up at home, I found that the aux out was fixed to 100% volume... so pretty painful. I was looking at the WXC-50 which has a pair of RCA pre-outs - would these solve the problem? I notice that the BL 6000 'wake-up' when activated, and other forum posts suggest that the line connection makes a buzzing noise? 1. Is the WXC-50 a good option? Will I be able to use it's volume control to manage the speakers? 2. Is there an alternative set of cables than just the RCA directly into the BL 6000? Only power cables were supplied with the speakers, so don't have any at the moment. Hallo Wiggster - Here what I found on the subject. but there there was no one with digital input and output. I was looking at the WXC-50 which has a pair of RCA pre-outs - would these solve the problem? Yes. There is a "preamp / player" switch at the back of the Yamaha unit. When set to "preamp", the level of the RCA outputs will be controlled by the device, allowing you to use your BeoLabs with it. As noted above, the WXC-50 can be set to pre-out (volume controlled). Also it has a handy 12v trigger output, with the correct adapter cable, you can have triggered "powerlink" to your BL6000s. Thanks all for the quick and useful responses - will look into the cable with triggers - sounds handy! will pick up the wxc-50 tomorrow- looking forward to hooking it all up! This was so very helpful! Thanks so much for sharing. I ended up getting the WXC 50, along with a small subwoofer. It works brilliantly - and I can’t notice any lip sync issues with the optical in... although I may have stared at it for too long! The phone connection in from my beogram 5500 is a bit quieter than the other inputs but think I might just need a better phone pre amp- plenty enough for now! thanks for all the replies - so helpful! Cheers- back to listening to those records now! Hi Jeff, good name there guy! This is designed for B&O gear, it not only has more gain, and a variable gain so you can match levels with the other sources (CD, streaming, etc.) but it has a DIN connector on the back as well as RCAs so you don't have to use a DIN to RCA convertor on the Beogram (most aren't factory wired with RCAs). I've used one of these for about 7 years so far with my Beogram 3000 Tangential with MMC2 and love it. Sounds great, plenty of gain to get the Beogram up to the level of the CD and Aux In on my Beosound 9000. Highly recommended, and affordable. I had the same issue with my setup using a more "traditional" phono preamp, there was a large difference in volume between the LP and the CD, and woe be unto you if you hit the CD button after playing an LP without first turning the volume down! Hope it works out as well for you as it has for me. Neat little company actually.